This unusual glimpse of the artist's studio shows the model with her back exposed above a rich, exotically coloured wrap. From her head-wear, in gold-trimmed purple, it seems that she might be in costume, perhaps for one of Clark's eastern subjects. The model's curved form stands out in the plain, conventionally furnished room with all its verticals. 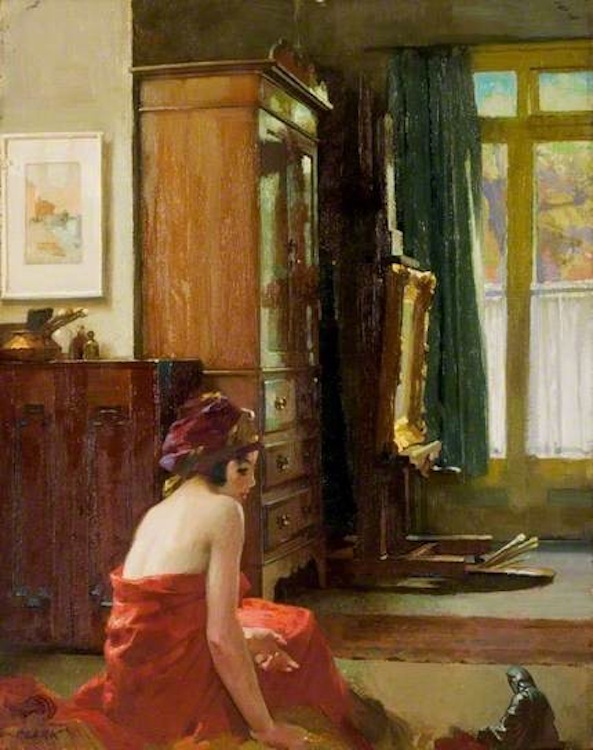 Of course, the artist himself is not seen: he is not at the easel, indeed, his palette is on the floor in front of it (he must be standing behind her, to the right). Nevertheless, the girl looks posed, and posed so as to contemplate the little figurine in the lower righthand foreground — which almost looks as if it might be engaged in the same occupation as the artist himself. This is a tantalisingly layered peep into the still, private world of artist and model.